I have dreamed of making a kilt like this since 1995, when I first got the kilt bug. I hope you will agree that it was worth the wait! The hybrid kilt is basically a utility kilt in tartan. Same basic design as our modern kilts but made out of tartan! The material is a woven fabric approx. wt 13 oz approx 50/50 wool and acrylic. This takes the great properties of wool and gives you a more breathable, cooler garment without the itch of wool! 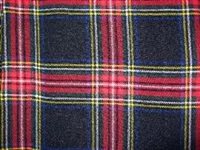 The kilt is fully lined, though you won't need it being very soft because of the blended fabric. 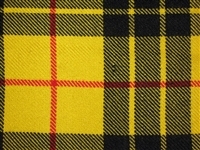 The pockets are lined to protect the tartan from sharp stuff in your pocket. The flap of the pockets are lined to strengthen for the snaps. We have also attached outer pockets to give you a place for that big cell phone and other essentials. The belts have a sandwich of tartan with cotton in middle to strengthen them. 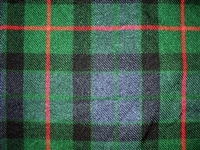 The kilt is available in 11 stocked tartans and available to order in over 60 different tartans and colors. Please be sure to take a measurement with a tape over your belt loops, these are NOT your pants size! 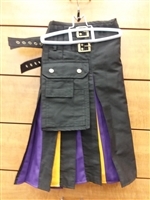 All of our in stock kilts are 23 inches in length. Need a different length? No problem! Don't see the tartan or size you're looking for? No Problem! 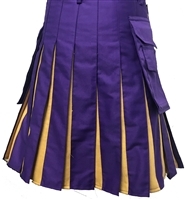 Check out our special order kilts! Click here to order a non stock material, color, waist size or length. The kilt is fully lined, though you won't need it. The material is very soft because of the blended fabric. The kilt is fully lined, though you won't need it. The material is very soft because of the blended fabric. The kilt is fully lined, though you won't need it. The material is very soft because of the blended fabric.